Creamy and sweet, cool bean salad. Place eggs in a small saucepan with enough water to cover. Bring to a boil, cover and turn off the heat. Let eggs sit in hot water for 10 minutes. Drain. Let eggs cool, about 5 minutes. Peel and dice. 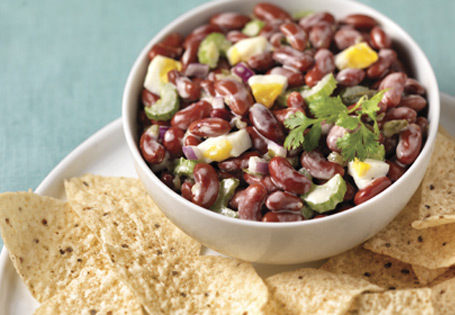 In a medium bowl, combine kidney beans, diced eggs, onion, relish, celery, salt, pepper and mayonnaise. Mix thoroughly. Chill if desired.